We own 35 acres of land in the Ghost Mine Ranch subdivision on the west side of the San Luis Valley, 8 miles north of Del Norte. 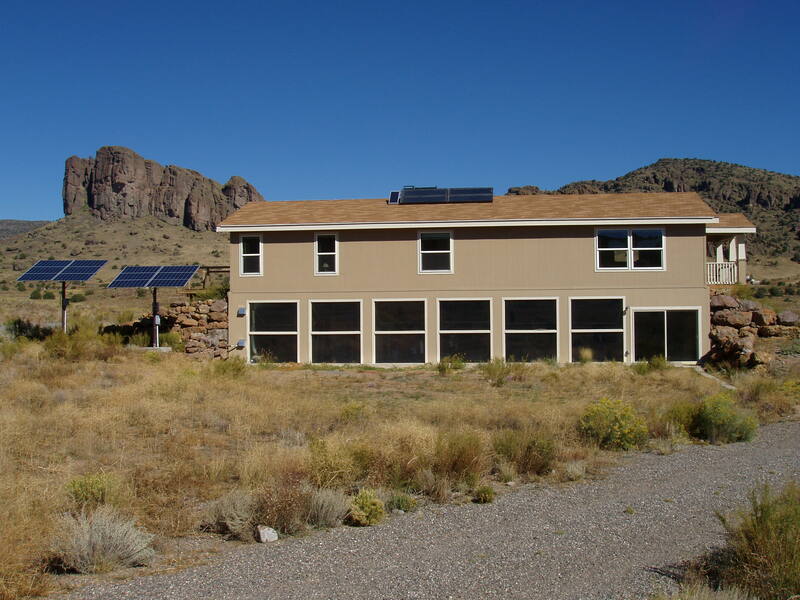 The climate of the San Luis Valley is cold but very sunny, making it suitable for a solar heated house. The current weather is measured by our weather station. Essentially all of the electricity used by the house is generated with a photovoltaic system. A solar hot water system provides nearly all of the hot water heating for the house. Our manufactured house is set on a basement of passive solar design, which collects sunlight and stores energy to heat the house. It is off the utility grid except for propane delivery and wireless communications. The Guerdon manufactured house was built with R45 insulation in the ceiling, but otherwise it is little different from other mobile homes built to HUD construction standards. Its windows are not optimized for solar gain, and are not particularly numerous on the south side. However, the south side of the basement is covered with windows which collect solar energy that is stored in concrete basement walls and gravel under the slab. Heat from the basement is circulated into the house through a system of vents and a computer-controlled fan. We have measured the solar heating performance of the design. During the 2013-2014 heating season the backup furnace ran for 0.5 hours. A poster (0.9 MB PDF) presented at the Joint CU/NREL Energy Symposium (October 3, 2006) describes the solar design and performance of the system. A slide presentation (1.3 MB PDF) given at the University of Colorado Civil Engineering building systems seminar (February 8, 2007) describes the design process, efficiency, and cost effectiveness.